My background is in zoology. It was around the age of eight that I decided I wanted to become a zookeeper. After earning a BS in Zoology and a specialized AS in Zoo Animal Technology, I eagerly set off on my chosen path. 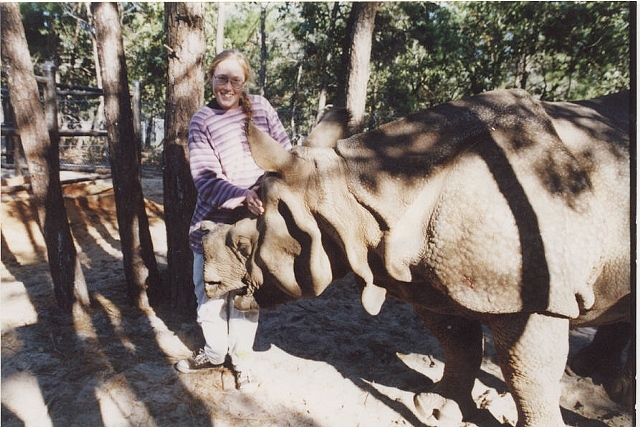 I worked as a zookeeper for 17 years. I have taken care of a wide variety of amazing animals, and somewhere in there my speciality ended up being with the hoofstock. I began working in clay in 2001. As my career as a zookeeper eventually wound down, I realized I enjoyed the ceramics more and more, and it naturally progressed into my next endeavour. Much of my work is thrown on the wheel, and then perhaps altered from there, although I have been enjoying more handbuilding as of late. Also very natural was the predominant theme of animals in my body of work, so I get to continue to share my love of animals. Another important component of my work is that I want to have fun. I am a fan of bold images using bright colors. I am enjoying creating these pieces, and expressing my sense of humor. I like to think that my work puts the fun in functional.